Who are they? Where are they from? What is the reason for their visits? These questions are a clear source of concern for late 20th century humankind, as well as a fascinating opportunity for human development, when it comes to facing facts that are as enigmatic as they are undeniable, and whose consideration is, without question, a matter of worldwide importance. Who has not felt uncertainty or curiosity when mention is made of them on the radio, or when reading about them in specialized publications that promote the awareness of close encounters of the third kind? These controversial entities are a matter of serious debate, and are properly documented throughout the history of UFOs. In order to better organize the answer to the first question, please allow me to classify them, first of all, according to the analysis resulting from the experience. Everything suggests that aliens having considerable interest in us. Swiss expert Erich Zurcher conducted a statistical-comparative analysis of our visitors based on height parameters, sampling 164 French cases. a. Up to 1.60 meters tall in 64% of cases. b. Between 1.60 meters and 2 meters in 24% of cases. c. Over 2 meters tall in 12% of cases. a. Up to 1.60 meters tall in 40% of the cases. b. Between 1.60 meters and 2 meters tall in 20% of cases. c. Over 2 meters tall in 40% of cases. We can see from this that the proportion of entities of intermediate stature remains coherent. Possible aliens involved in surreptitious visits to our territory have been seen collecting plant specimens and leaving ground imprints that give away their incursions, enough to confirm any presence of the UFO phenomenon (CE-2K). They have also seen wandering in unlikely places (such as cemeteries and forbidden areas) and finally, causing a commotion among peaceful residents from the air. On July 17 1952, a UFO was photographed over the city of Matanzas, Cuba by citizen Guillermo Zincke, employing his camera and telescope. The negatives were immediately seized by the military. Let us then discuss the hypothesis of the origin of these "apparent" astronauts backward, because they are doing nothing more than imitating our own unquestionable aims during moon landings or other space launches since 1957. A very fashionable but somewhat antique hypothesis has been put forth by scientists of the stature of Jacques Vallée, who appears to be convinced of the extra-dimensionality of the level in which these mysterious creatures operate, capable of controlling us by telepathy, abduct us and penetrate bedrooms while we dream. If the truth be told, Harold Goodwin, an adviser for the U.S. National Security Research Council, had already written in 1955: "It has also been suggested that flying saucers are a three-dimensional manifestation of something that comes from a parallel or multi-dimensional world existing alongside us." Another crucial element is the arrival of galactic and intergalactic little men, an alternative made possible by hyperspatial flight, accelerated technological development and a biological capacity for survival. Would these societies, evolved in all ways, be willing to have dealings with us? Could we understand them? Many convergent lines of thought have emerged, setting forth logical propositions that involve spatial races within the confines of our solar system, whether by selectivity or other evaluations of the phenomenon. Official science, always highly conservative, would rather not speculate about space platforms, the hypothetical planet Phaeton - disintegrated between the orbits of Mars and Jupiter, the infamous 12th planet with its unique elliptical orbit, the oft-spoken of planet Clarion, a world located beyond Pluto. Newcomers might hail from there, as the planet is impossible to see and would have the same size and mass as Earth, with the Sun always standing between both worlds. As our own planet increases or decreases speed, Clarion does the same. Elsewhere, allusions are made to justify the poor relations between Extraterrestrial Biological Entities (EBEs) with Earthmen due to the pollution of our current atmosphere. Offworlders would conceal themselves in areas that contemporary man would find to reach, such as the ocean floor and inaccessible areas of the Lithosphere. In any case, these ancient fellow travelers are caused us to reassess notions of our own origins and destiny. Cloning, electronic experiments involving animals and the recent history of the Cro-Magnon Man, with his evolutionary leap in brain capacity, should give us instructive possibility for answers. If our Visitors are not Earthmen from the future, they could be linked to the dark history of some forgotten civilization, constituting an area of research within the new discipline known as Paleo-Astronautics. Finally, what do they seek in the third blue planet? The answer is attractive, from a philosophical perspective, and has academic and ufological nuances. Perhaps they need us in ways we cannot imagine, and without meaning to do so, have kept them on tenterhooks with our lack of harmony and the deterioration of our environment. Gathering leaves, stems and leaving a few meters of land in an awful condition, snooping around their intellectually younger brothers, subtly displaying their technological prowess, do not seem to be the only goals set by these beings. We must therefore infer (within our own mental parameters) that they are morally, ethically and spiritually superior. They are simply observing us constantly, hoping that we will understand the futility of our own lack of understanding. In the meantime, they experiment upon us with luminous beams, electromagnetic, gravitational and extra-sensory systems. Sexual relations also form part of their agendas. It could be that human skin and our metabolism as a whole, along with our flora and fauna, minerals, the smiles of lovely Earthwomen, the causes behind feelings and tears, pain and happiness, in other words, are of interest to them. Perhaps they can see in this world of ours, on which we are burdened by its extreme conditions, a way of recovering aspects that they left behind millennia ago in the rising tide of their natural psychobiological development. Perhaps they regret having experimented excessively upon themselves; although this gives a clear (and positive) message that they were able to survive nuclear, ecological and genetic Armageddon. The growing and "infringing" presence of these Vistors and ancient unknown characters on the premises of the Cuban archipelago pose a challenge to our understanding, and a thinly-veiled message to those who only think about Western sensationalism, mass hysteria (ironically assisted by radar, photo cameras and videos), and the wayward planet Venus, the scapegoat for myriad disinformers. 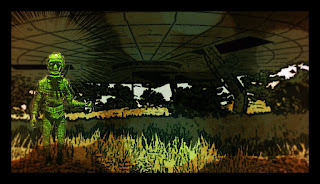 "Absurd" or aberrant experiences on the one hand, and the mystical bent of others (abductees, mystics), joined with the extrasensory powers of these entities and conveyed to some humans, according to thousands of eyewitness accounts worldwide, allow us to conclude that official researchers and ufologists alike are perplexed, finding themselves in a blind alley. Time will prove us right in the end, given the concern over this subject in many sectors. Finally, will Science be able to give us an answer? If Science would only trust and work more closely with genuine ufologists (whether orthodox or not) all over the world, the answer would probably be less uncertain and much more original, aiming toward a public opinion that will worthy of its trust. - Almanaque Mundial (1996). “OVNIS Nuevas Revelaciones. Editorial Televisa. - The UFO CASEBOOK. Capitan Kevin D. Randle, Warner Books 1989 (USA). - El Viaje Interrumpido. John G. Fuller.Edit.Plaza Janés 1968 (Spain). - Time Magazine, June 23 1997. USA. - Revista UFO Nov-Dec 1995. (Italy). - We ae not the first .Andrew Tomas. P. Janés (Spain) 1973.